Study also shows that fast food restaurants are misleading consumers about the oils they use to cook their food products. American fast food is almost entirely produced from corn according to a chemical analysis of dishes served at McDonald's, Burger King, and Wendy's. The study is published in the journal Proceedings of the National Academy of Sciences. Using a stable isotope analysis of carbon and nitrogen to determine the origin of molecules present in hamburgers, chicken, and fries, Hope Jahren and Rebecca Kraft found corn to be the almost exclusive food source of the beef and chicken served in fast food restaurants. The researchers also uncovered evidence to suggest that fast food restaurants are misleading consumers as to the oils used in preparing french fries and that animals slaughtered for production are kept in confined quarters, rather than outdoors. The authors say the finding that fast food restaurants are not accurately reporting their sources of oils, lends support for legislation mandating ingredient labeling for fast food. Presently ingredient reporting is a "voluntary and seldom-invoked" process. "Fastfood corporations, although they constitute more than half the restaurants in the U.S. and sell more than 1 hundred billion dollars of food each year, oppose regulation of ingredient reporting," the authors write. 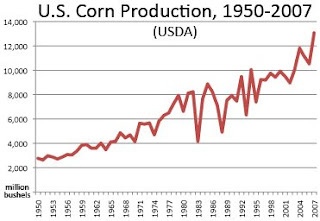 "Ingredients matter for many reasons: U.S. corn agriculture has been criticized as environmentally unsustainable and conspicuously subsidized. "Of 160 food products we purchased at Wendy's throughout the United States, not 1 item could be traced back to a noncorn source. Our work also identified corn feed as the overwhelming source of food for tissue growth, hence for beef and chicken meat, at fast food restaurants." The idea that corn — and its derivatives — is increasingly the basis of the American diet has recently been popularized in Michael Pollan's book The Omnivore's Dilemma and the film King Corn. A diet consisting of fast food and products with high fructose corn syrup — including soda, which was excluded from the PNAS study — has been blamed by nutritionists for driving rising rates of obesity and diabetes in the United States as well as other health problems, including heart disease. Making consumers aware of the source of their food is a critical first step to improving the American diet, say Jahren and Kraft. "Our work highlights the absence of adequate consumer information necessary to facilitate an ongoing evaluation of the American diet," they conclude.